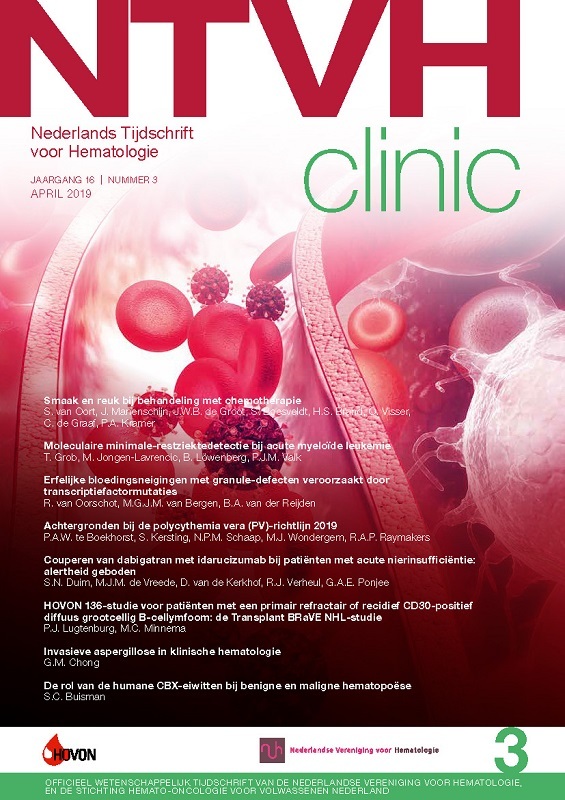 The Dutch Journal of Haematology (NTvH) is published 8 times a year and is distributed through controlled circulation in the Netherlands free-of-charge to haematologists, paediatricians, transfusion doctors, laboratory physicians, internal medicine specialists working in the field of vascular medicine and those in training for these specialisations. The Dutch Journal of Haematology is the official platform of the Dutch Society of Haematology (NVvH) and the clinical research organisation HOVON. NTvH is a practical and informative medical journal. The aim of the journal is to provide insight and overview of the latest medical developments to medical specialist who are working in a clinical setting. Through NTvO, one is informed quickly about new relevant developments for clinical practice in the field of haematology. The content is compiled by an independent editorial board, written by medical specialists in Haematology and is peer-reviewed in order to warrant objective information. Of course, NTvH is open to contributions from readers. Spontaneous submissions can be published after review and approval by the editorial board. More information about submissions is available under: Submission of manuscripts.